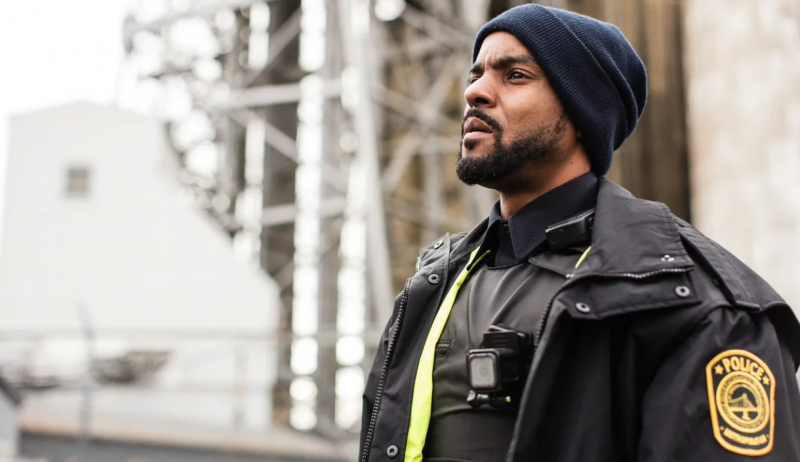 Black Cop in some ways is a fantasy drama that dives deep into the heart of social inequality and profiling. While not unpredictable, the film blends a message-driven story with sprinkles of satirical humor and offbeat scenes that seem to be pulled from the main character’s conscience. The journeys into Black Cop’s mind, played by Ronnie Rowe Jr., felt misplaced but were clear attempts to provide perspective to the unnamed man while adding levity to an otherwise lead-filled topic. To many Americans, Canada isn’t seen as a country with deep civil unrest or bias. Director Corey Bowles’ use of Canada as the backdrop for this twisted story was a bold decision that ultimately paid off. The events of the film seem to be taking place in Fall or early Winter and provided an almost London-esque feel of melancholy gray that fit the underlying tone. Black Cop’s true charm is in the moments of interaction between the main character and another female officer. The relationship travels a life’s journey, in a short time, with pitstops through admiration, uncertainty, disgust, sympathy, and understanding. Whether you are a person of color or not, the plight portrayed in the film speaks to the human spirit and delivers a message that will get audiences thinking.